Doctor Who: I’m the Doctor By the Way…Run for Your Life!!! On Sunday, October 7, at 12:45 p.m. CST, we get the premiere of season 11 of Doctor Who, with Jodie Whittaker as the Thirteenth Doctor. I’m so excited for this that I’m willing to miss the NFL. The first episode of the Thirteenth Doctor got me thinking [always a dangerous thing] about the first episodes of the other previous Doctors. What were their first episodes about? What are the similarities of the episodes, and their differences? How will it relate to the new episode this Sunday? I decided to keep this exploration to the NuWho era, 2005-Present. Therefore, I will discuss the first episodes of the Ninth Doctor, Christopher Eccleston; Tenth Doctor, David Tennant; Eleventh Doctor, Matt Smith; Twelfth Doctor, Peter Capaldi. The last official sighting of the Doctor was in 1996 in San Francisco in a TV movie on Fox. The series itself ended in 1989. Since this was the first episode in the NuWho era, a lot was riding on it. It wasn’t a sure bet that Doctor Who could work in the modern TV era. The episode not only introduced us to the Ninth Doctor, it also introduced us to Rose Tyler (Billie Piper), her mother Jackie Tyler (Camille Coduri), and her soon to be ex-boyfriend Mickey Smith (Noel Clarke). They eventually confront the Nestene Consciousness at the London Eye, where the Doctor pleads humanity’s case. The Doctor: “This planet is just starting. These stupid little people have only just learned how to walk but they’re capable of so much more. I’m asking you, on their behalf, please just go.” Of course, the villains don’t listen, so surprisingly, Rose saves the day. The Doctor invites her to travel with him, and their adventures begin. Christopher Eccleston only served as the Doctor for a season. We soon had a new Doctor, David Tennant. His first episode was also a Christmas episode, the first Christmas episode of NuWho and a tradition. Aside from the Doctor, the cast stayed the same. The barely regenerated Tenth Doctor was largely absent from the episode. He’s generally unconscious except for when he first stumbled out of the TARDIS, rescued Rose, Jackie, and Mickey from a Christmas tree and the final third of the episode when he finally woke up and faced the Sycorax aboard their ship. The Sycorax invaded Earth on Christmas and used blood control over everyone who was A positive to try to force the Earth to hand over half the population as slaves. As the Sycorax ship leaves Earth’s orbit, Harriot had Torchwood destroy the vessel. The Doctor is furious and he tells her, “I gave them the wrong warning. I should have told them to run, as fast as they can. 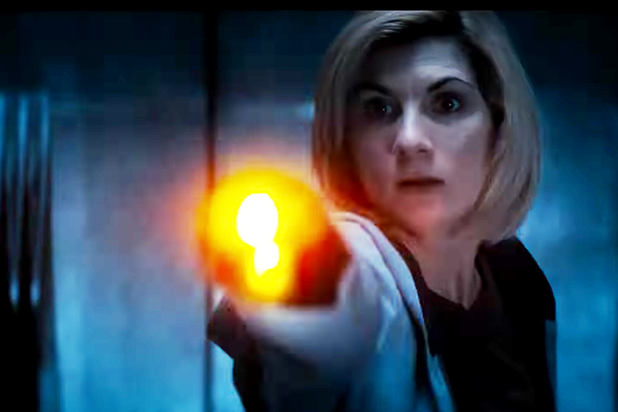 Run and hide, because the monsters are coming…the human race.” Rose is at first taken aback by a new Doctor, but by the end of the episode, she’s ready to resume traveling with him. When David Tennant left the show, the showrunner, Russel T. Davies was also leaving. Therefore, the show would not only have a new Doctor, but a new showrunner, Steven Moffat, along with a new cast. The Eleventh Doctor (Matt Smith) crashes in the yard of a young girl named Amelia Pond (Caitlin Blackwood). Amelia has a crack in her wall, something that would be important throughout the fifth season and weaved throughout most of the Matt Smith era. They see a large eye through the crack and find out a race called the Atraxi are looking for an escaped prisoner named Prisoner Zero. Before the Doctor can do anything about this, he has to leave but he promises Amelia he’ll be right back. When the Doctor returns, he finds out it hasn’t been a few minutes, but twelve years, and the occupant of the house is a grown up Amy Pond (Karen Gillan). Amy is furious with the Doctor, since he broke his promise and everyone thought she had made all of it up. The Doctor has to regain her trust because the Atraxi are still looking for the shape shifting Prisoner Zero and they are ready to destroy the Earth if the humans don’t turn it in. Prisoner Zero had been hiding in Amy’s house all of this time. Prisoner Zero was getting around in the form of comatose patients. A nurse, Rory Williams (Arthur Darvill) had noticed seeing these patients in town, but the head doctor wouldn’t believe him. Rory also turned out to be Amy’s boyfriend, though Amy wasn’t keen on admitting it. The Doctor suffers a little disorientated from his regeneration, and he can’t use his TARDIS or screwdriver to help him in this situation. There is also a strict time limit before the Atraxi destroy the planet, but the Doctor is still the Doctor and with the help of Amy and Rory, they turn over Prisoner Zero to the Atraxi. The Doctor: “You’re not the first to have come here. Oh, there have been so many. And what you’ve got to ask is what happened to them?” [The Atraxi look at a montage of the past ten Doctors. The Doctor steps through the montage when it shows the 10th Doctor.] The Doctor: “Hello. I’m the Doctor. Basically. Run.” After they take off the Doctor leaves again, and he’s two years late returning this time. He does keep his promise and takes Amy with him. The change from Christopher Eccleston to David Tennant, is similar to the change from Matt Smith to Peter Capaldi. It is the same showrunner and the same companion, Clara Oswald (Jenna Coleman). When the regenerated Twelfth Doctor stumbles out of the TARDIS, three familiar faces from the Matt Smith era greet him; Silurian sleuth Madame Vastra (Neve McIntosh), her human wife [and maid] Jenny (Catrin Stewart), and her Sontaran butler Strax (Dan Starkey). The Doctor is suffering from severe regenerative trauma, but unlike the Tenth Doctor, he’s in most of the episode acting confused and dazed. He starts acting like the Doctor when he and Clara meet at a restaurant run by the clockwork people. The Doctor deducts that the patrons in the restaurant aren’t people, that he and Clara are on the menu, and later, that Clara will have to hold her breath. When it looks like he has abandoned Clara, it’s only a ruse to rescue her. It confirms he is still the Doctor we know and love. They then begin to realize that someone who wanted them together placed the ad in the newspaper that brought them together at the restaurant. When they get back to the 21st century, Clara is unsure about staying with the Doctor. She receives a call from the Eleventh Doctor to help the Twelfth Doctor. The Doctor: “Well?” Clara: “Well what?” The Doctor: “He asked you a question. Will you help me?” Clara: “You shouldn’t have been listening.” The Doctor: “I wasn’t. I didn’t need to. That was me talking. You can’t see me, can you? You look at me, and you can’t see me. Have you any idea what that’s like? I’m not on the phone, I’m right here, standing in front of you. Please, just, just see me.” She finally realizes he is the same person. The episode ends with Missy (Michelle Gomez) telling the Half-Face Man that he made it to paradise. Missy placed the ad and she becomes a major character in the Capaldi era. I haven’t seen the new episode yet. I don’t know how closely it will follow the previous episodes. If I have to guess, it will probably be closer to The Eleventh Hour. We have a new Doctor, new cast, and new showrunner. From what I’ve read and seen in interviews, they are making this season very accessible to new viewers.